The families, friends and graduates of the University of Notre Dame’s Class of 2016 in Notre Dame Stadium Sunday morning (May 15) braved unseasonably chilly weather to celebrate the University’s 171st Commencement Ceremony. Before degrees were conferred on 2,163 Notre Dame undergraduates, Rev. 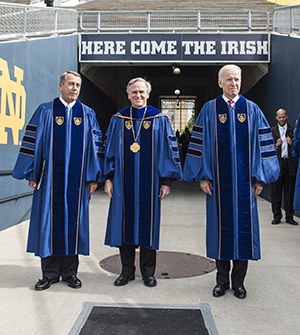 John I. Jenkins, C.S.C., the University’s president, introduced Vice President Joseph Biden and former Speaker of the House John Boehner, the recipients of the 2016 Laetare Medal, Notre Dame’s highest honor. Father Jenkins acknowledged that both political leaders “have cast votes and taken positions about which many among us have reservations, in some cases grave moral reservations. We cannot and do not turn a blind eye to such reservations. We award you today the Laetare Medal not to endorse particular positions you have taken or votes you have cast, but because each of you has given his life to serve the common good in political leadership by your own best lights. In the first acceptance address, Boehner spoke of his affection for two former Notre Dame football coaches from his native Ohio, Gerry Faust, who had been Boehner’s coach when he played football at Moeller High School in Cincinnati, and his friend Lou Holtz. He also spoke of his friendship with his political opponent Biden. “Governing is the art of the possible. Politicians are constantly being pushed to promise the impossible,” Boehner said, "but governing isn’t about promising the impossible. Governing, in its essence, is the art of the possible. Governing requires us to look for common ground where it can be found — without compromising on our principles. The Laetare Medal presentations were followed by the conferral of honorary degrees on Gen. Martin E. Dempsey, former chairman of the Joint Chiefs of Staff, and five others: molecular microbiologist Rita Colwell; civil rights movement leader Diane Nash; outgoing University Board of Trustees chairman Richard Notebaert; internationally acclaimed jazz and classical musician and composer Arturo Sandoval; and Pauline Yu, president of the American Council of Learned Societies. A sixth honoree, Cardinal Donald Wuerl, archbishop of Washington, D.C., received an honorary degree Saturday evening while serving as the presiding celebrant of Notre Dame’s 2016 Baccalaureate Mass. During the ceremony, in addition to receiving an honorary degree, Notebaert became the first recipient of the Hesburgh-Stephan Medal, named in honor of the late Rev. Theodore M. Hesburgh, C.S.C., Notre Dame’s 15th president, under whose leadership the Board was established, and Edmund A. Stephan, first chairman of the Board. The medal recognizes a Trustee, whether lay or a member of the Congregation of Holy Cross, for uncommon and exemplary contributions to the governance and mission of Notre Dame during his or her tenure on the Board. 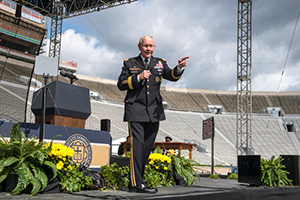 Originally published by Michael O. Garvey at news.nd.edu on May 15, 2016.